Another trip to California, another batch of plants from Mesa Garden. 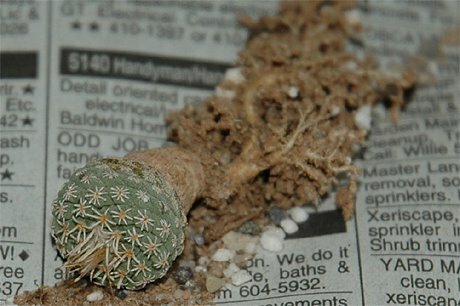 Apart from winter hardy species of Escobaria, Echinocereus, and Opuntia, I also received three Ariocarpus fissuratus plants (JM122, Fort Stockton, Pecos Co., Texas) and another Strombocactus disciformis (SB174). 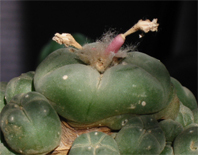 The Ariocarpi are approximately 2.5 cm (~ 1’’) wide, 6.5 cm (~ 2.5’’) high, and an amazing 8 years old – a great illustration of the quote “Ariocarpus, Cacti for the Young (or Young at Heart)”. 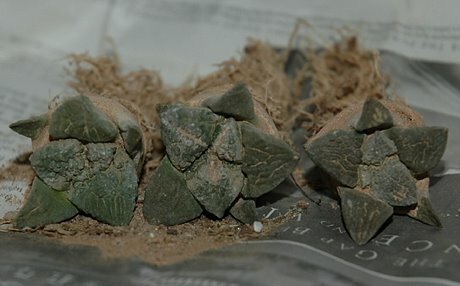 I potted the Ariocarpi yesterday in a mix consisting primarily of limestone gravel with some loamy sand and a tad of regular potting soil added. 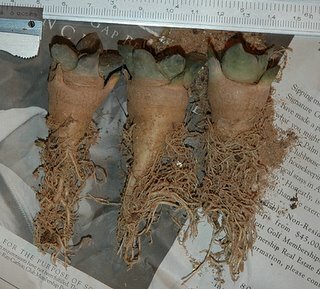 The new Strombocactus disciformis plant is 1.35 cm (~ 0.5’’) wide and 2.1 cm (~ 0.8’’) high, and is now growing with the two Strombos received previously. I must mention that I’m impressed with the quality of the plants and the service received from Steve Brack.